Sony suspends release of PXW-FS5 firmware version 4. I don’t think I have ever seen this before. the version 4 PXW-FS5 firmware update. 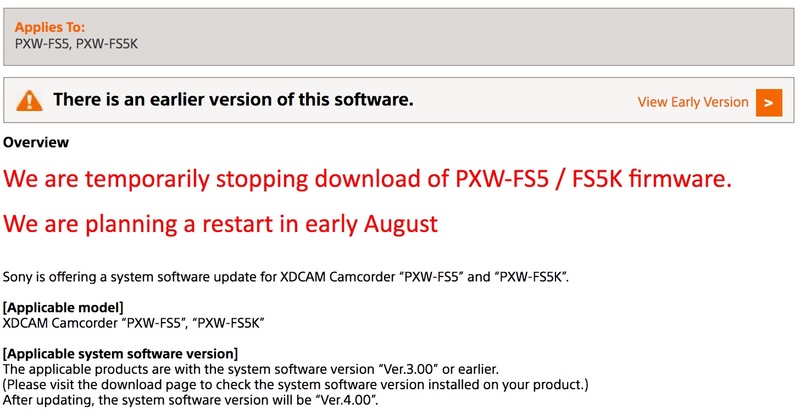 Just a few days after the release of firmware version 4.0 for the PXW-FS5 and Sony have taken it down from their websites and suspended the release until some time in early August. So far no explanation has been given and understandably those that have already applied the update to their cameras are somewhat concerned as there is no way to roll back the firmware. Clearly something is up, but I don’t know what. To halt the firmware release it must be something of some significance, but I don’t know what that might be (Update: One possibility is that it could be due to the issue with playback in Adobe Premiere). I have sent emails to my contacts in Sony, but have yet to receive a reply. I know some of them are on holiday. If I hear anything I can share I will let you know. In the mean time… I updated my FS5 on the 20th. I have been using it every day since then and so far nothing bad or unusual has happened. Nor have I heard any reports of anything that may be of concern. So I would not panic if you have already done the update. I doubt it does any harm to the camera. Previous PostPXW-FS5, Version 4.0 and above base ISO – BEWARE if you use ISO! !Next PostWhat is HLG and what is it supposed to be used for? Do you think we will have the option to re-install V4? It’s been postponed, so it will still come, just not right now.